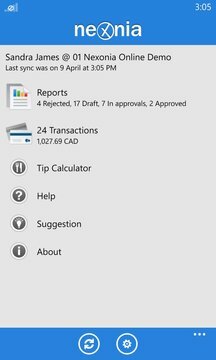 Nexonia Expenses is our expense report application for Windows Phone. It's part of a full corporate expense solution and a Nexonia account is required to use it. 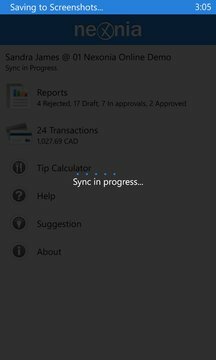 Nexonia's expense report application allows users to enter expenses, take pictures of receipts with the camera and then submit them for approval. With the push of a button, all expense reports, their receipts and any modifications will synchronize with the full Nexonia expense management solution. This app requires an existing Nexonia account, which you can register by visiting www.nexonia.com (including a free 30 day trial). Our full expense management system has full accounting integration, unlimited and flexible approval steps, line item approval and rejection, full reporting capabilities and user/security management.